Barry & Sue Horne and Duffy a 4 month old lurcher. After 29 years in the RAF followed by 8 years in industry we took early retirement, sold the house and everything in it and moved aboard the narrowboat. We had owned a 57 foot cruiser stern narrowboat for 5 years previously which we used for holidays and weekend getaways. We had also taken several narrowboat holidays when the children were younger. So this is something we have always wanted to do. We are looking for a simpler, more relaxed way of life but have yet to find it! However, we have been live aboards for only 7 months so still finding our way. We purchased Adagio second hand – she was 18 months old when we bought her. The name encapsulated our dream of life afloat so we kept it. We have owned a narrowboat for just over 5 1/2 years. Winter! Especially when frozen in and unable to move anywhere. Kind of defeats the whole idea of an itinerant lifestyle. Sense of freedom and visiting different places and meeting new people. Add an engine room, back cabin and more storage!!! Canalside and local farm shops. We use a supermarket if nearby town has one close to the canal. We try to buy diesel and coal from canal traders – there are plenty of working boats plying trade on the Cut. We have a washing machine. Adagio has some pretty beefy electrical power systems so appliances are not really an issue. Vodafone mobile broadband and, no, not satisfied with the service! Very patchy coverage away from major cities/towns or motorway corridors. We have a 240v AC Travel Power set feeding a Victron combi invertor/charger which, together support a bank of AGM batteries for domestic power. In our opinion you cannot have too much power! Work out how much you are willing to downsize then at least double it! Space is at a premium even in the longest narrowboat. Also consider the problems with healthcare if you intend to continuous cruise. The NHS is not set up to support people living the itinerant life. Oh, and think carefully about the toilet system you want. Pump out is fine until you are frozen in somewhere for 4 weeks or more. Cassettes are easy but you need to plan stops to include acces to Elsan disposal points. A combination of both is probably best for continuous cruising. Otherwise just do it! 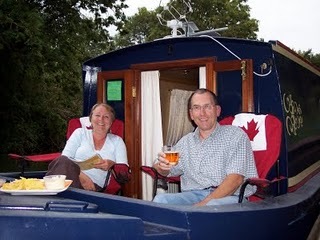 Sue and Barry Horne have been blogging about their narrowboat life since August 2009. You can read about their adventures here.